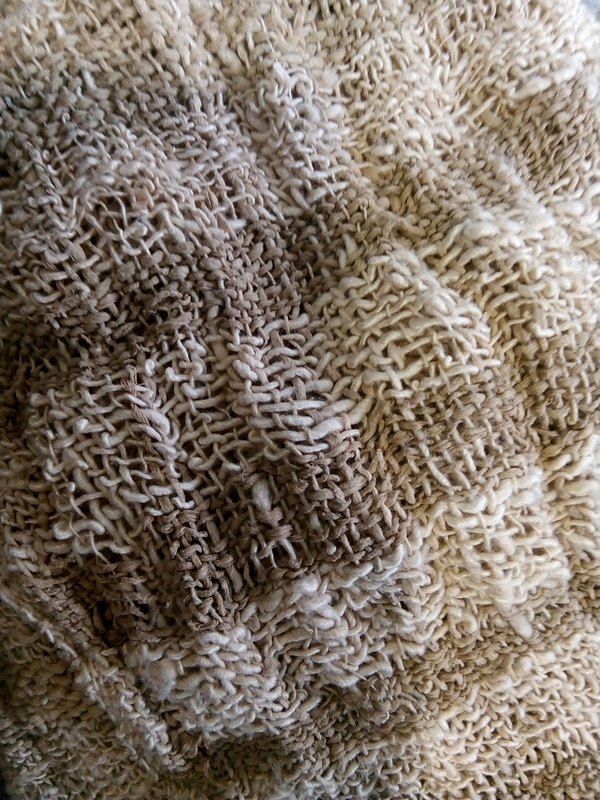 It is definitely a lot like linen in feel, but has a sheen that’s really silky. The cloth had a great drape and that surprised me because it had a… stiffness? density? I’m not sure what the word is, but it was like I could imagine linen of a similar ply feeling like. 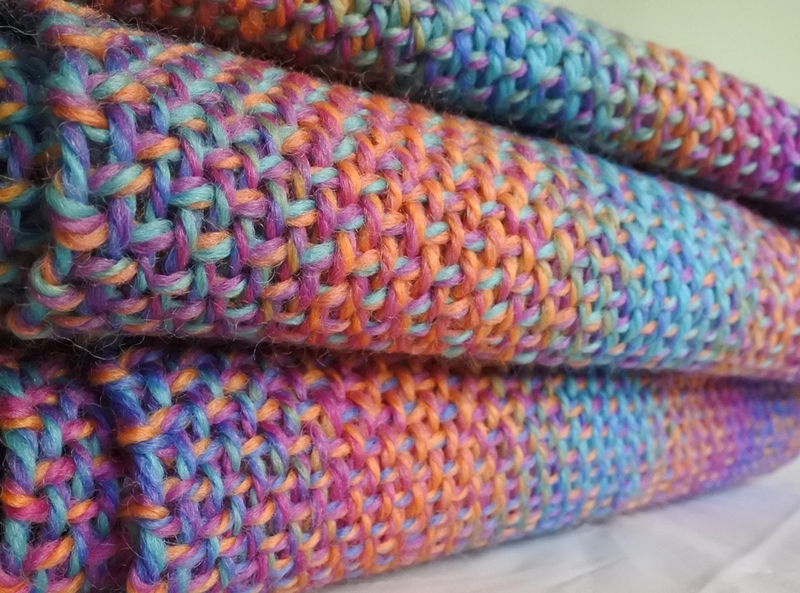 The muted colours of this scarf are lovely too, don’t you think? And the pattern is part colour and part different ply yarns which made for a very attractive scarf! Someone I work with, who is a keen traveler, has found out that I weave. As a result I’ve been shown a range of wonderful photos of the workshops he visited in Myanmar where they make cloth from lotus flower fibre! The locals harvest and process the lotus plants and then spin it and weave the yarn into cloth. With any luck he will remember to bring in the scarf he bought for his wife and I will be able to report back on what this interesting fabric feels like! Having a look online it gets described as a cross between silk and linen in feel, which sounds fascinating. At work the other day they’d been running a team-building activity that involved building a tower so they had all of these materials sitting in a box. Wire. Yarn. Sticks. 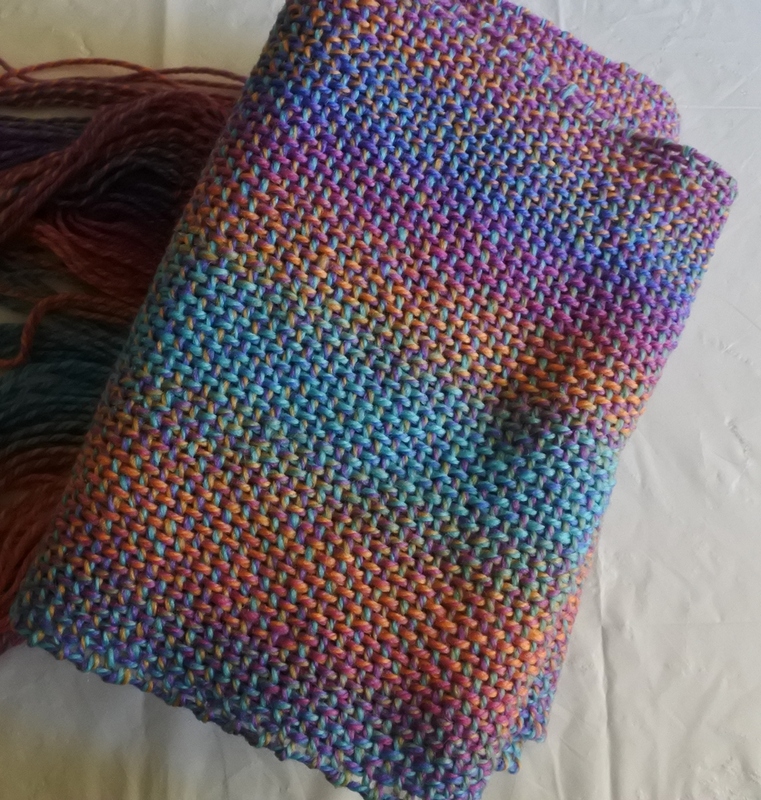 I have to admit I kept staring at it thinking if I took the wire and used it to make a frame with the sticks I could use the yarn to make this… or that… or that! I resisted the urge to make anything (they might want to use those materials in future), but the yarn-y, craft-y bits of my brain were firing all day. I hate to see things go to waste, particularly “useful” things like containers, so when my workplace had a sudden glut of plastic tubes I was very excited! But, I know from past experience that I can collect containers only to throw them out – completely unused – years later. So, I took a conservative 5 tubes to try them out. I doubt any craft-er would be surprised to hear me say I found a range of ways to deploy the tubes, but the truly wonderful bit is they are now integral to my thrum storage system!! This is where thrums have always gone, but now… look at those peek-a-boos of colour! Turns out the tubes sit on their heads rather nicely in my thrums drawer and I can cram quite a bit in each one. Soooo satisfying. Of course the extra joy of this approach is I can see the yarn! The drawer, I should point out, is only half full in the above pic. 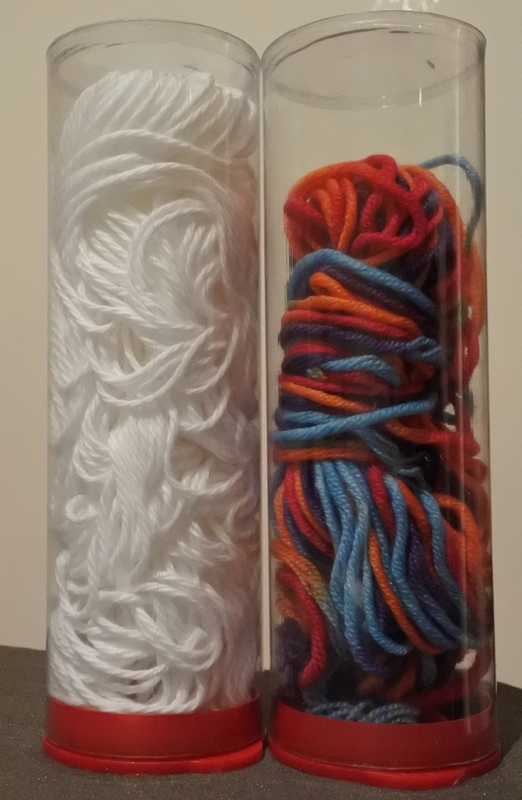 And I’m going to take the ball-bands I’ve got for (most) of these thrums and put them into the tubes, so I will always know what the yarn is. Organisational goodness. Oh how I love a good recycling project. I might have mentioned there was a yarn audit going on recently. Turns out I have 160 different types of yarn comprised of 200 untouched balls/skeins and around 50 “too big to be called thrums” leftovers from previous projects. It feels about the right size for me. Enough that I won’t have to run out to get matching colours for the weft-only yarns, and enough that I can’t possibly get bored! The funny, and maybe a little sad, thing was discovering just how many of my stash yarns have been discontinued. Now, some companies keep things fresh with short-run fancies etc and that makes perfect sense, but I was surprised at the range that have passed into stash-history over the 2.5 years I’ve been weaving! I often buy a single ball of a yarn, but maybe I should buy more in future? Maybe not…the upside of just one ball is I mix yarns a lot more and have to be creative in their use! Which of course suits me perfectly. The plan now is to never have to audit my yarn again (it took days!) and just update my trusty spreadsheet as I use yarn and, well, buy more, because we all know that’ll happen!! 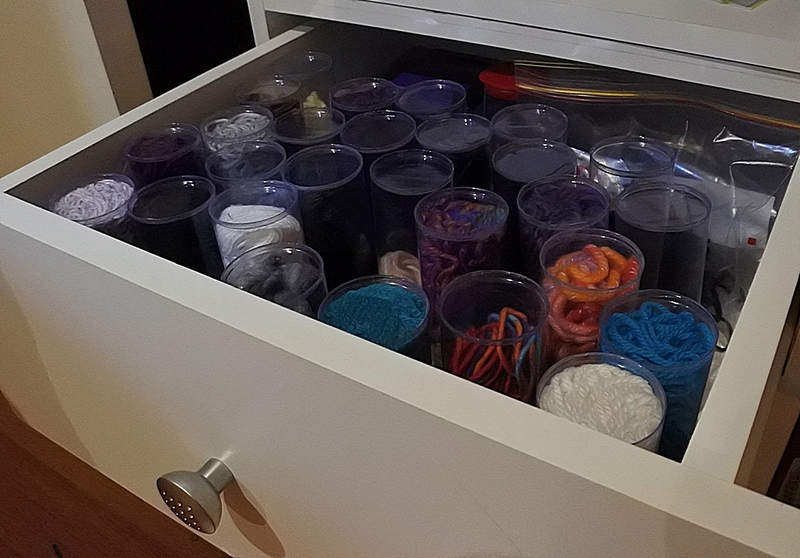 Posted on February 28, 2018 February 18, 2018 Categories learner weaverTags balls of yarn, stash, yarnLeave a comment on How big the stash? I’ve had a bit over a week off work and there was a list of errands and chores as long as my arm to keep me busy. But then came the weather. I’m no one’s friend when it’s either humid or over 33C so, as I said in my scarf in a day post, I was hiding and weaving. What I didn’t expect was that I’d weave quite this much! I did a yarn audit in the middle of the week, so I have an excuse to buy more yarn… okay, technically it was to refresh my memory of what’s there, but the shopping part of my brain had an eye on whether the yarn store had space to grow (it does… squeeeeeeeee!). The other result of the audit was finding balls of colours that I don’t normally use. 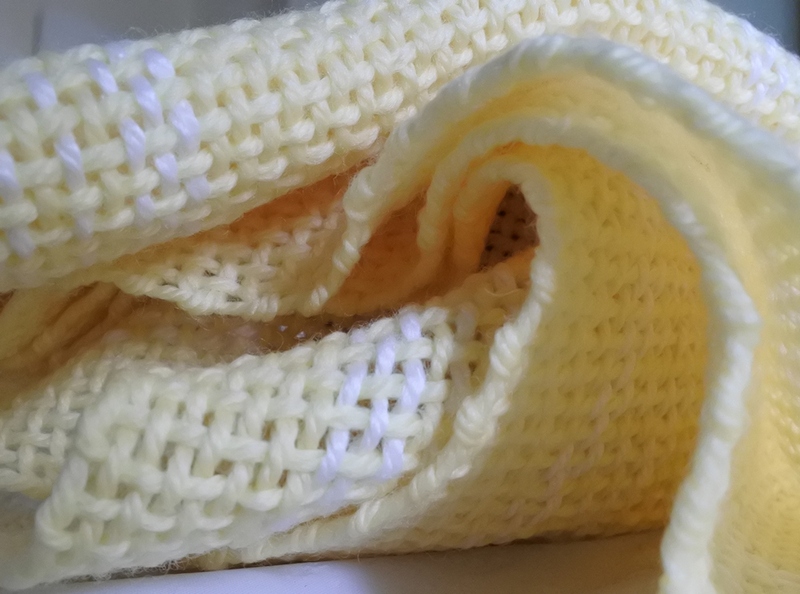 A pale lemon scarf with white stripes was the result! 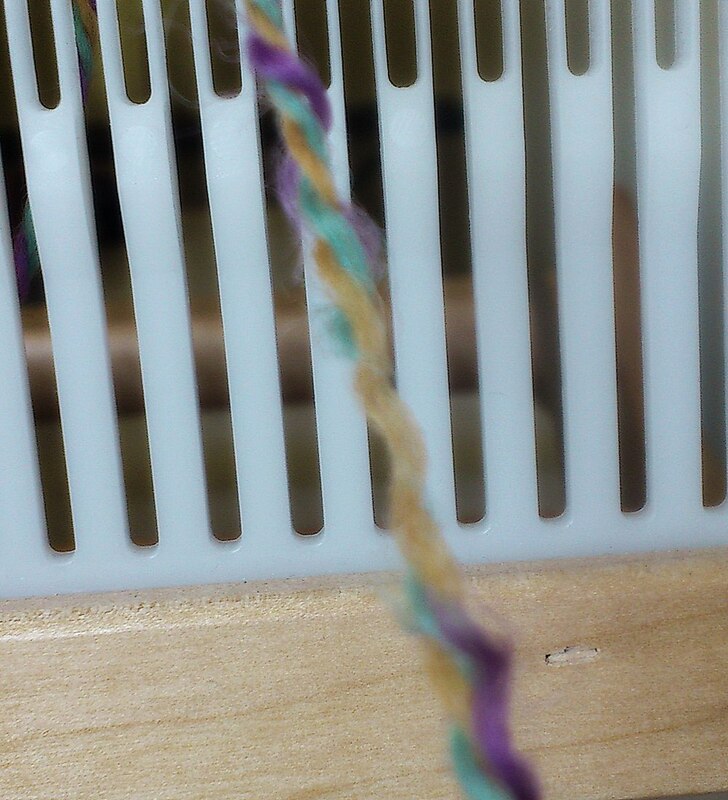 So I’ve warped a colour pattern and, for something different, I threaded before winding on the warp (that’s the back beam in the foreground there). The pattern will slow the weaving down some – not as much as being back at work though! 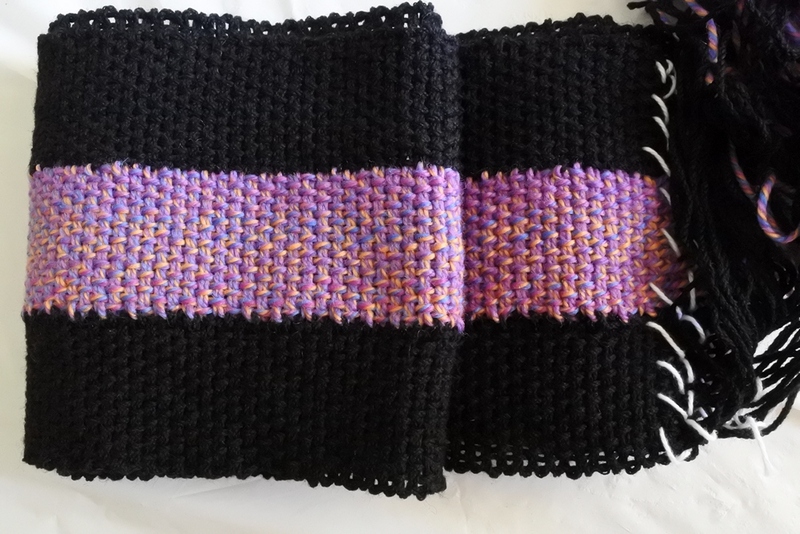 As it has been a bit hot (40C/140F) the past days, I hid in the aircon with my loom watching movies. Wonderful thing about having a rigid heddle loom… you only need a table and your lap anywhere in the house! 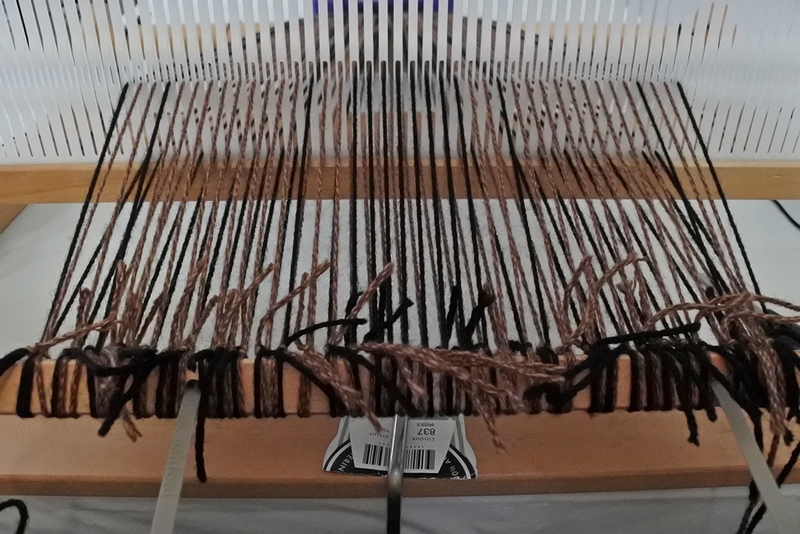 I’d actually measured and wound the warp onto the back beam earlier, but something was niggling at the back of my mind… I’d glimpsed a broken thread somewhere… note to self: don’t listen to extremely interesting podcasts while dressing the loom! The yarn gods were smiling though, because I had one more warp end than I needed so I could just pull this end out. Despite the broken bit, it is gorgeous wool. 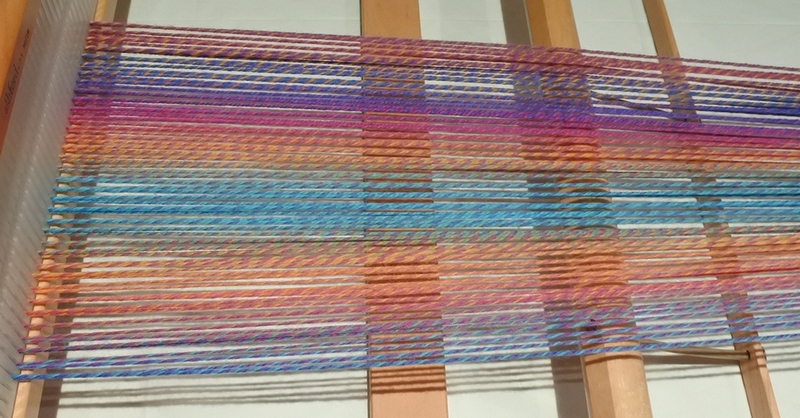 I’ve not woven a vari that is a ply of multiple colours and then crossed it with itself. But this was the yarn I sampled last year. I’d thought it’d look good with purple – which it did – but against itself it was stunning. What fascinates me, is the interplay of the colours… the long change of the variegation gives strong warp strips and these don’t blur or get muddied by a weft that’s going through the same changes. The colour twist gives it such a lively surface too. Up close it almost looks busy. I’m looking forward to seeing if it changes at all when fulled!